Patricia Jennings met Georgia O’ Keeffe when she was 12 years old and the famous artist came to her family home on the island of Maui to spend ten days there as part of her 1939 trip to Hawaii. Patricia’s mother was to officially host Miss O’Keeffe but she was called to her ailing mother’s bedside in California just before the artist’s arrival. Since Patricia’s father was busy with his work on their sugar cane plantation Patricia was appointed to drive around Maui with Georgia and show her the sights. 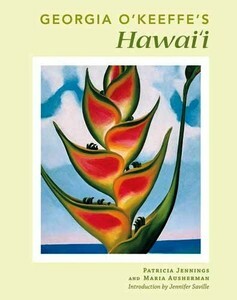 In the book Georgia O Keeffe’s Hawaii Patricia talks about how scared she was to meet the artist because her parents had told her Georgia was eccentric and temperamental. I read about Georgia’s trip to Hawaii in a magazine when I was touring the Big Island in February. It inspired a blog post and I decided I wanted to learn more about Georgia’s time in Hawaii so I ordered the book about the artist by Patricia Jennings and Maria Ausherman. Patricia who is now a great-grandmother, has never forgotten Georgia, because although she was somewhat moody and strange she treated Patricia like a real person and not a child. She listened to Patricia’s ideas, asked her opinions, and even let her watch her paint on occasion, something the mercurial artist rarely allowed. Patricia’s parents were not unkind, but merely self-absorbed and busy. They seldom took the time to really listen to her. Georgia did. Georgia even let Patricia pose in the hat she’d bought to keep out the sun and protect her from the salt mist. At one point during the visit Patricia thought she’d lost Georgia’s friendship when Patricia’s dog Lucky tramped over some paintings Georgia had left to dry on the floor. Georgia was angry but instead of apologizing Patricia admonished Georgia for leaving her paintings on the floor and said it wasn’t her dog’s fault. Georgia laughed, agreed Patricia was right, and gave her a big hug. For several years after Georgia returned to New York she wrote letters to Patricia reminiscing about the good time they’d had together. Patricia says she learned many things from Georgia during the short time they spent together, talking with her and watching her paint. Georgia O’Keeffe painted many vibrant works of art during her time in Hawaii but she also left an indelible mark on a little girl by simply treating her like a person of value. I know some of my blog readers also read my weekly columns in The Carillon, but many do not, so from time to time I post one of my columns here. We are back in Phoenix Arizona now and I just wrote my second column about our visit to Hawaii. 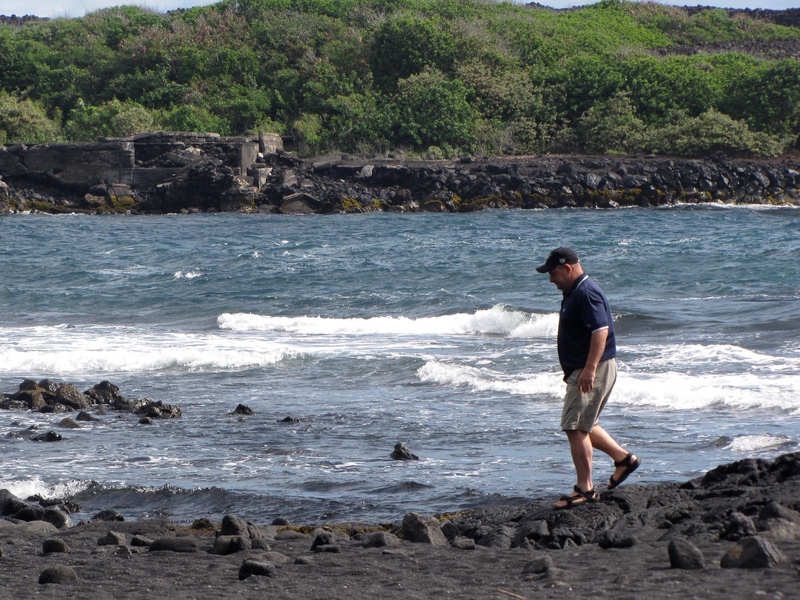 Our two weeks in Hawaii were very different from each other as my two columns reflect. Am I becoming a travel snob? 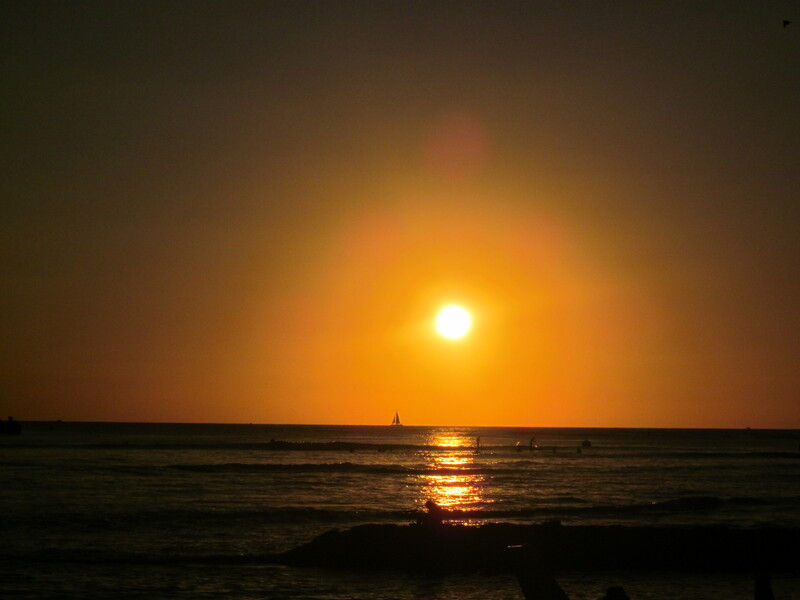 We spent last week on Oahu Island in Hawaii and compared to many other holidays we’ve been on it was rather mundane. I know any vacation is what you make of it. Over the last eight years as my husband Dave and I have traveled to dozens of different countries, I’ve always found it easy to have a positive attitude and appreciate the unique beauty of each place we’ve visited. That wasn’t the case on Oahu. Our bed and breakfast, which was quite pricey, was frankly the worst we’ve ever stayed at. It had peeling paint, thread-bare carpets, stained walls, a musty smell, a self-serve breakfast with the number of cups of coffee rationed, hosts we barely saw and a bathroom we shared with three other people that wasn’t cleaned regularly. We are die- hard bed and breakfast rather than hotel people when we travel, but Oahu had us rethinking that choice. 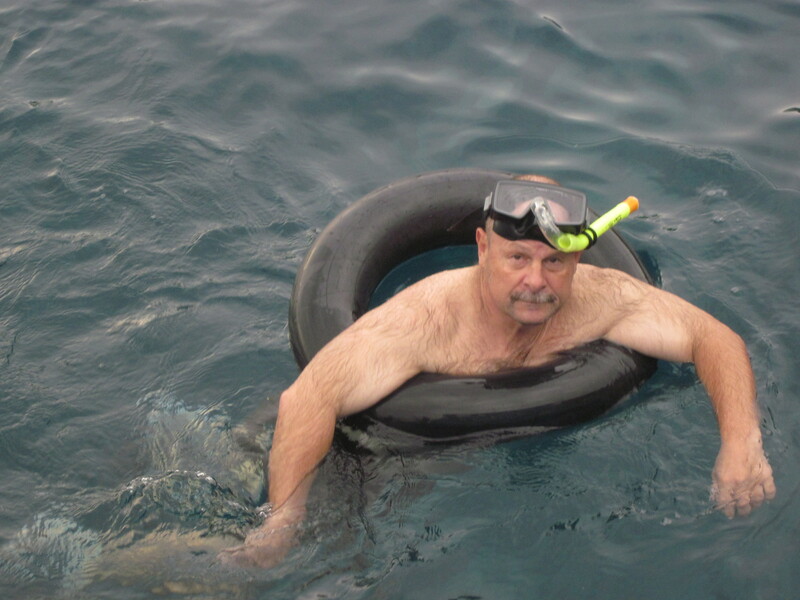 The snorkeling at Oahu’s famed Hanauma Bay was another disappointment. The water was shallow so we cut ourselves on the sharp beige coral and we only saw a few fish. After memorable snorkeling experiences in Fiji and on Malaysia’s Perhentian Islands where the fish were plentiful and the coral every hue of the rainbow, Hawaii’s snorkeling was blasé. The Bishop Museum in Honululu, seemed tired and pedestrian, more like the neglected museums we saw in Ukraine rather than a modern, inviting place like Chicago’s Art Institute or the Canadian War Museum in Ottawa. You expect in North America museums will keep up with the times –not the Bishop. 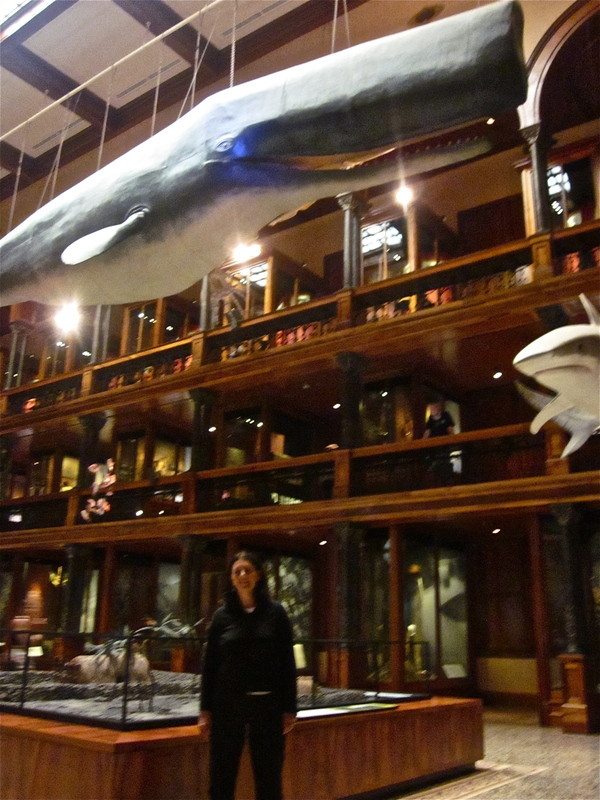 The museum is funded by a trust established by a Hawaiian princess. The successive cadres of white American men who’ve administered it have paid themselves millions of dollars in salaries. They’ve invested in poor financial ventures in which they had personal interest, thus depleting the principal trust so there is little to spend on its designated recipients, one of which is the museum. 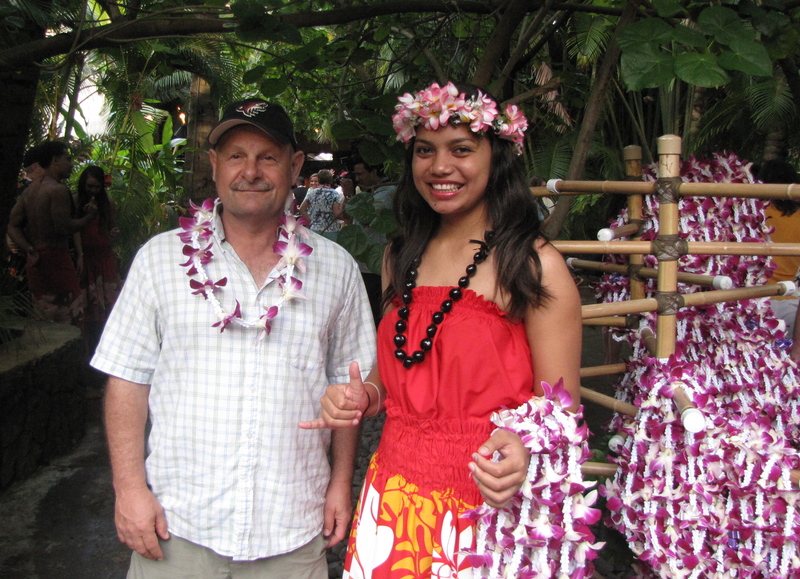 We went to a luau, supposedly Hawaii’s best, at the Polynesian Cultural Centre. Staffed by Mormon students from the Hawaii campus of Brigham Young University the luau was an interesting, but somewhat troubling mix of religion, entertainment and culture. The food was nothing special and the professionally executed performance a blatant rip-off of Disney’s Lion King. 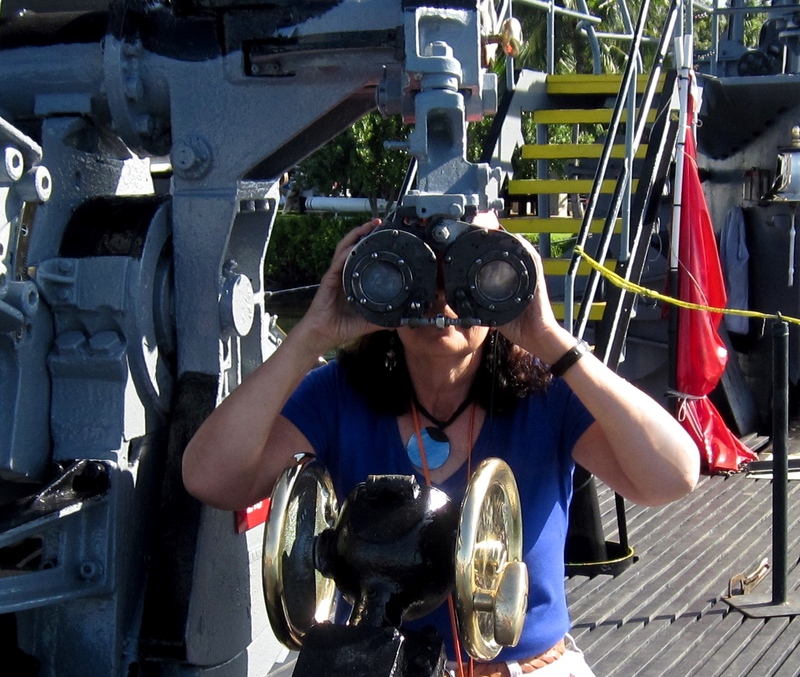 One thing we really enjoyed on Oahu was our day at the Pearl Harbor site. We toured a submarine, museum and memorial. Everything was visitor friendly and interesting. However touring all the areas of the site cost around $100 US for the two of us. We went to a very similar memorial and museum in Hiroshima Japan that was equally well maintained and organized and paid only $1 US. 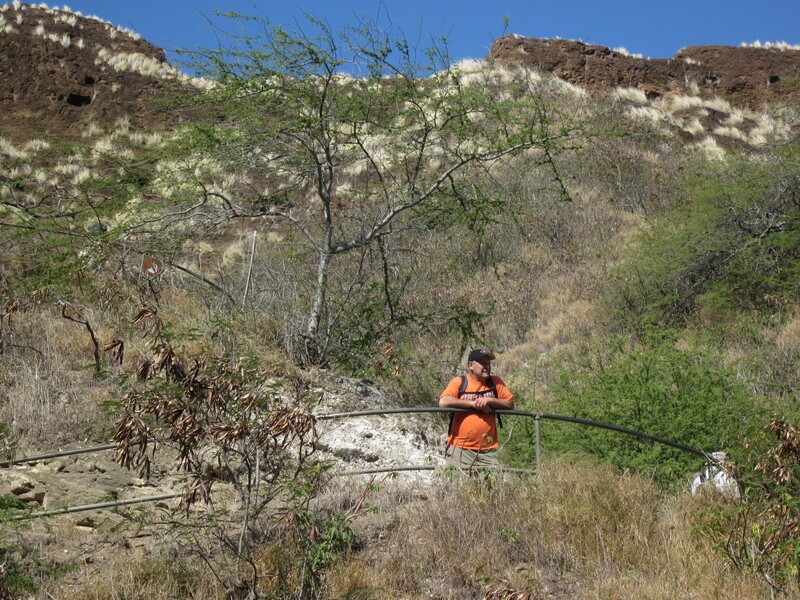 We hiked to the top of the Diamond Head Crater. We enjoyed the view but the trail needed work and it wasn’t always wide enough for two hikers to pass one another easily. Spoiled by the pristine hiking trails and spectacular views I’d experienced in Sedona, Arizona just the week before, Diamond Head seemed bland and tired. After a week in Oahu I’m feeling like a bit of a travel snob. Have my years of world travels jaded me to such an extent that I expect too much of my holidays by now? I’d like to think that’s not true. We’re headed over to Hawaii’s Big Island for a week there and I’m expecting a much better experience. I’ll let you know in next Thursday’s column whether I’ve regained my joie de vivre for travel. 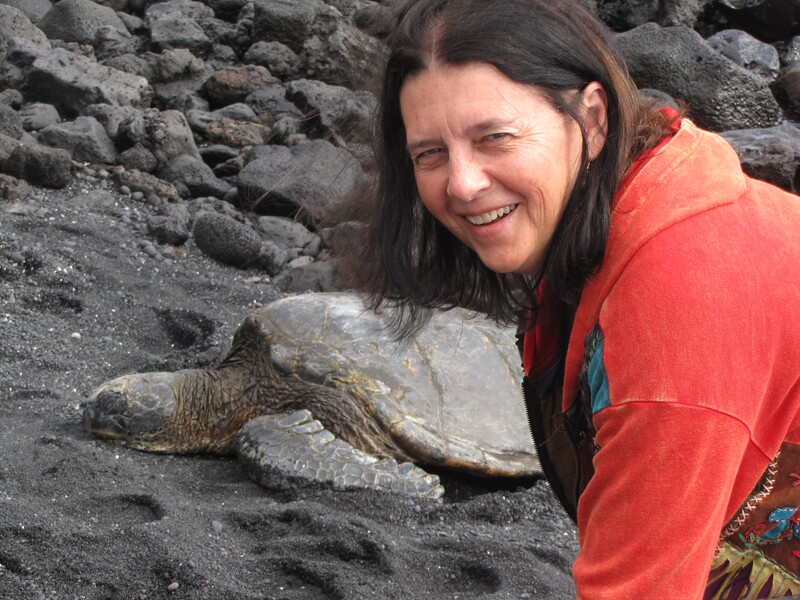 Getting up close and personal with an active volcano, snorkeling with a dolphin pod, hiking up to a remarkable waterfall and observing huge green sea turtles, made our trip to Hawaii’s Big Island a memorable adventure. We flew into Kona and driving out of the city you knew you were in volcano territory because black lava rock extended out in all directions. 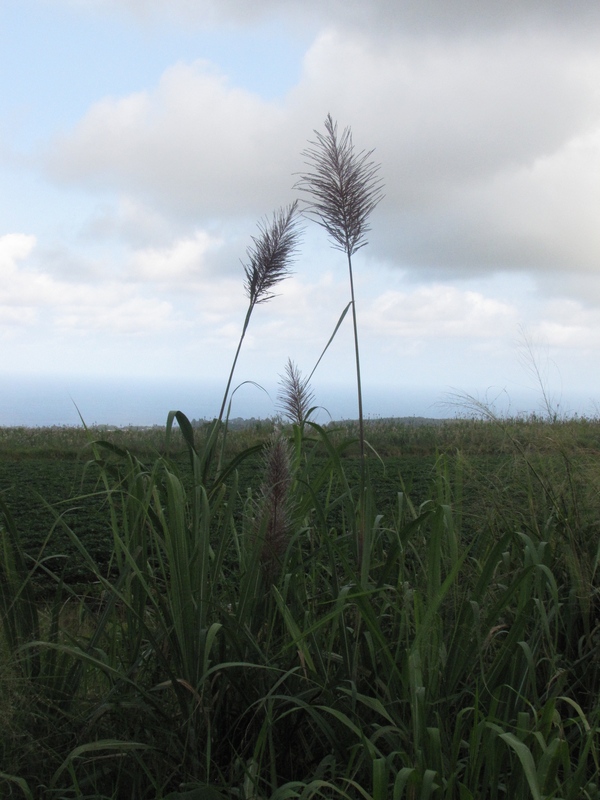 The landscape of the Big Island is intriguingly varied. There are black, green and white sand beaches. Besides the vast expanse of rock there are coffee plantations, areas of lush green vegetation, mountains and rolling hilly cattle ranches. We stayed in Volcano Village near the entry to the Volcanoes National Park at a charming bed and breakfast. It was called The End of The Road, because literally it is at the end of a long winding road. Run by Hawaiians Ray and Lani Goodness Glory it is a warm, spacious home decorated with Lani’s vibrant photographs of Hawaiian flowers. We like bed and breakfasts because of the interesting fellow guests we meet. 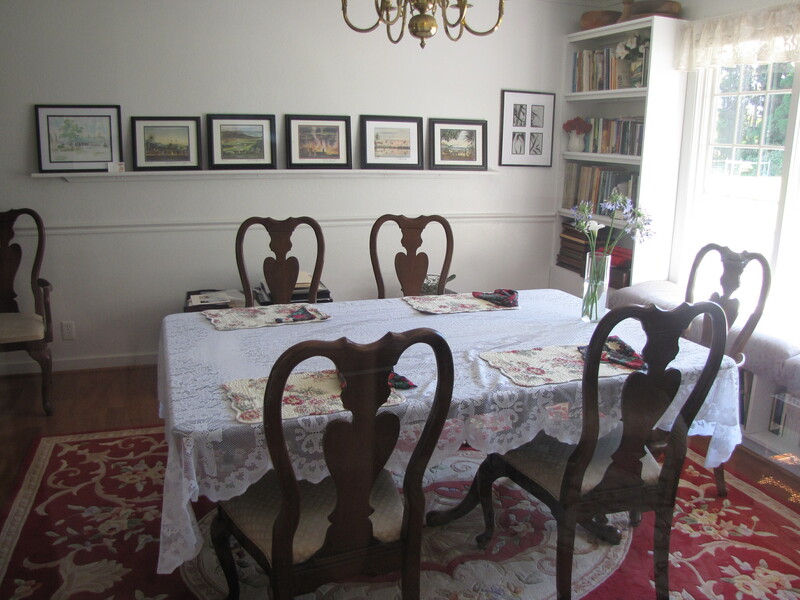 We breakfasted in the Goodness Glory’s sunny dining room with a couple from Kingston, Ontario. Their Hawaiian vacation was a reward after a grueling, but ultimately unsuccessful, cross Canada campaign trip to try to win the presidency of the Liberal Party of Canada. 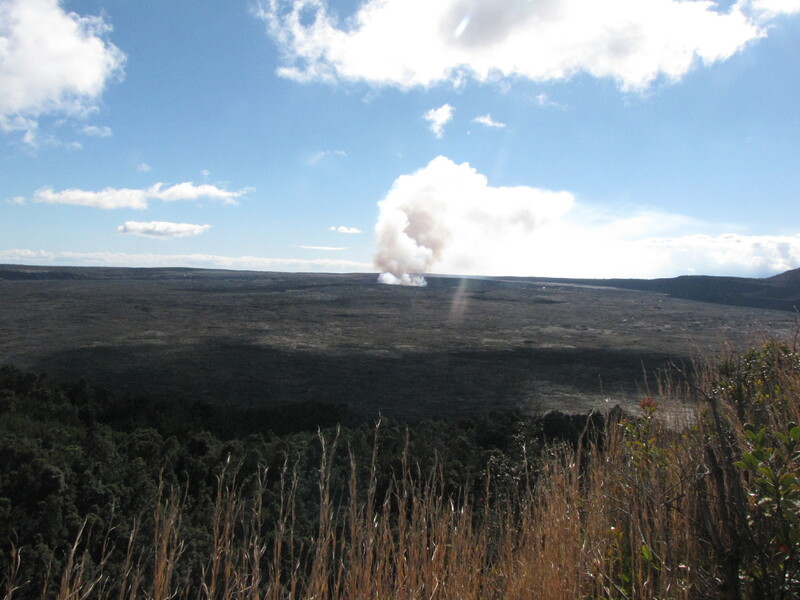 Active volcanoes make living in the Hilo area of the Big Island decidedly unpredictable. We hiked a trail to see the Kilauea volcano. It’s latest eruption began in 1983 and it has been erupting continuously ever since. 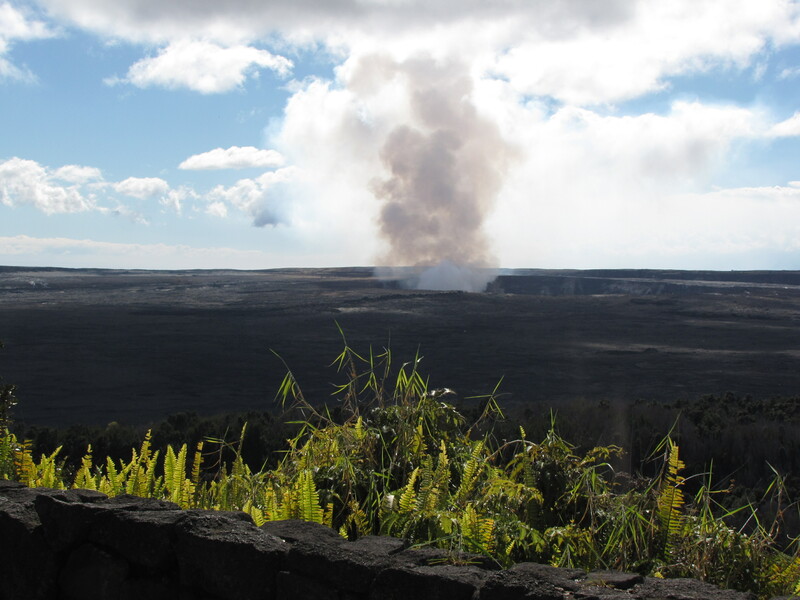 The Big Island experiences a hundred small earthquakes everyday and this creates many steamy vents and craters. As you hike in Volcanoes National Park, bright yellow warning signs make it clear visitors need to stick to the trails if they don’t want to be burned by the steam and hot rocks. 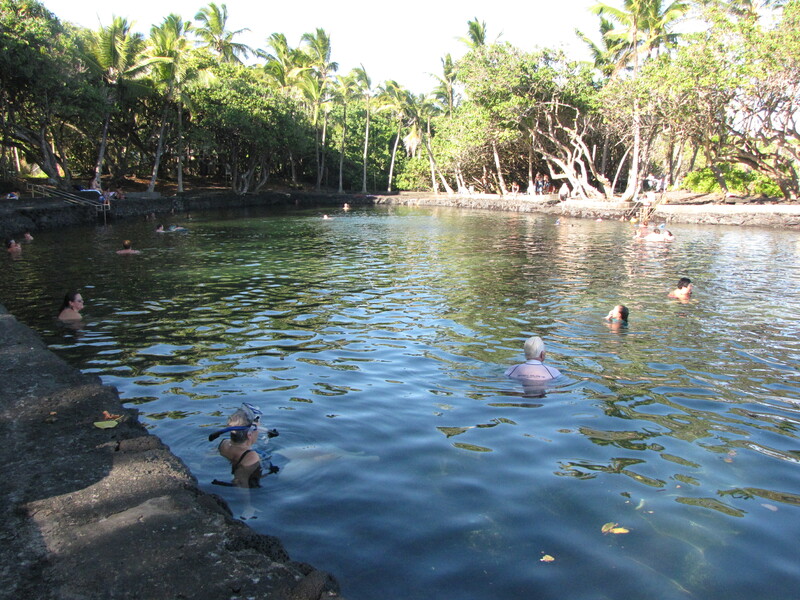 At Ahalanui Park we went swimming in a volcanically heated natural thermal pool. Just outside the pool’s stone enclosure huge Pacific Ocean waves were crashing into the rocky shore but we could float idyllically in the soothing 90- degree water. 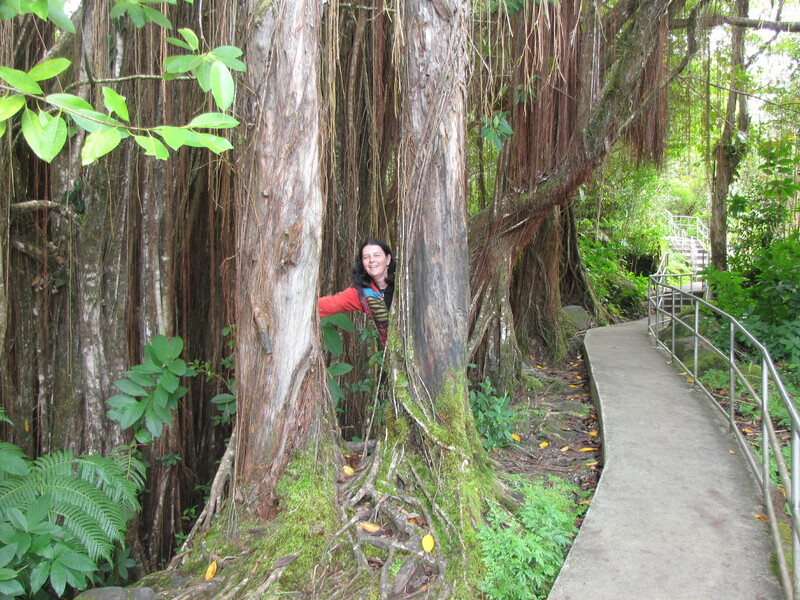 We walked through a Lava Tree Park. In the 1700’s lava flow swept through the site coating the trunks of the trees and leaving weird and wonderful hollow hardened lava molds. We rented a car and drove right around the Big Island. 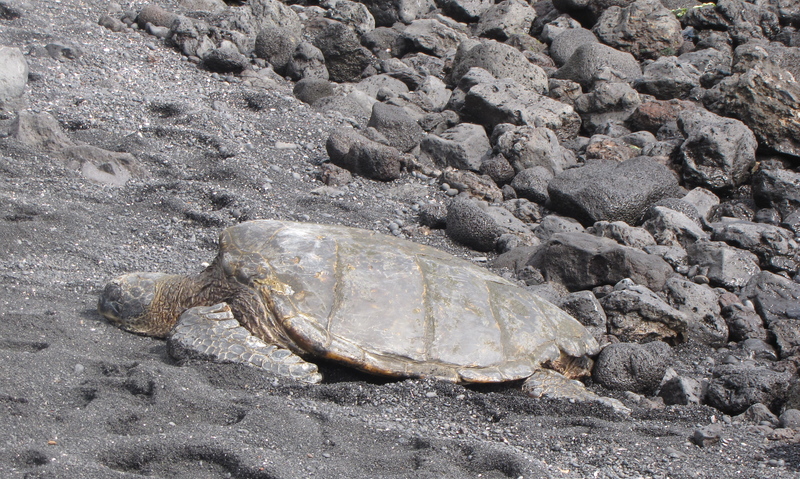 Journey highlights were a stop at the Punalu Black Sand Beach, a favorite haunt for Hawaii’s endangered green sea turtles. Sure enough, a couple were resting on the sand and feeding in the shallow water just off shore. 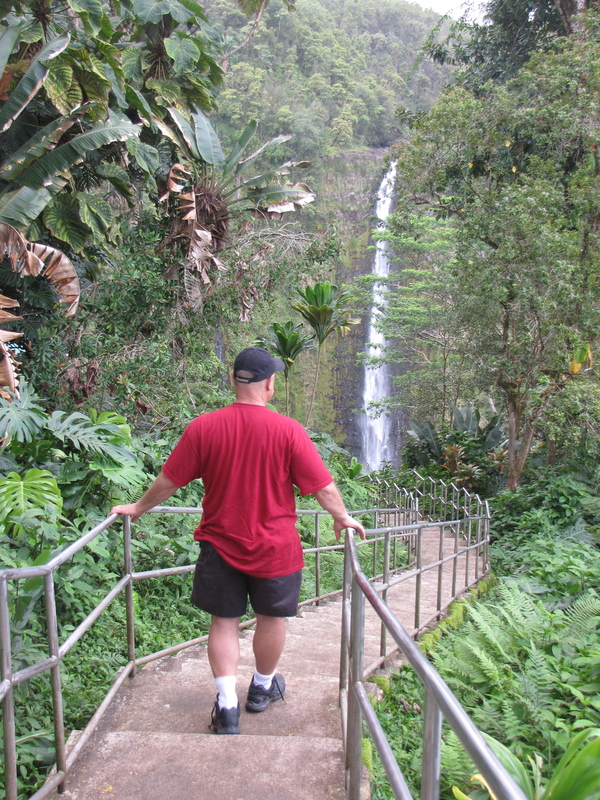 We hiked up to Akaka Falls, twice the height of Niagara Falls. I took photos of the unique flowers and plants as we hiked. 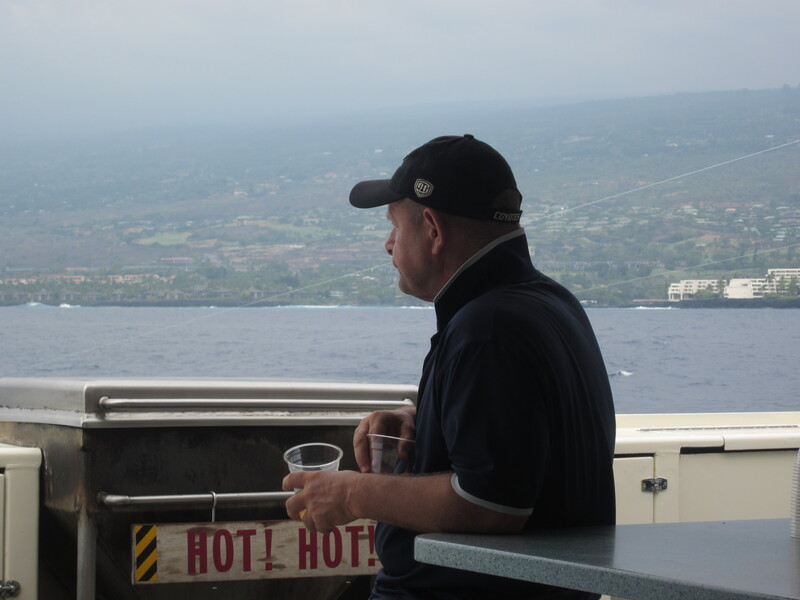 We made a snorkeling trip aboard the Fair Winds catamaran out to Kealakekau Bay. It is an underwater marine park with huge diverse coral and fish of every hue and shape. A pod of about a hundred spinner dolphins shared the bay with us during our snorkel. Last week in my column I suggested I was less than enamored with Hawaii after spending time in the big city of Honolulu. It seemed commercialized, crass and rather mundane compared to many of the places I’d traveled. 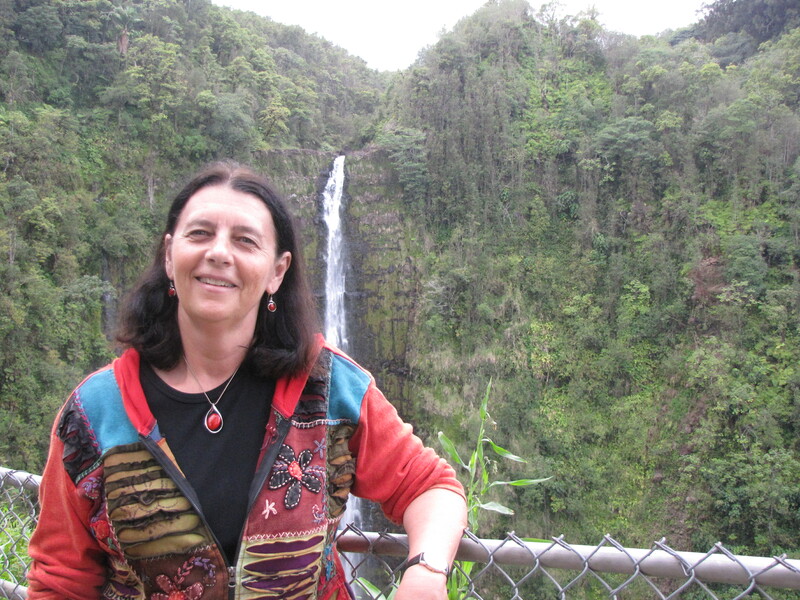 The Big Island of Hawaii was a totally different experience. It provided many fascinating adventures that had us thinking we would need to go back to Hawaii in the future to visit its other islands which we didn’t have time to explore on this visit. Hawaii deserved a second chance. I’m glad I gave it one. The second book I read in Hawaii was Molakai by Alan Brennert. One of my former students who lives in Honolulu, Matthew Jang recommended it to me when we visited with his family our first week here. He said the book was assigned reading in one of his English classes and it was the best book he’d ever had to read for school. Molakai is the Hawaiian island where more than 8000 people with leprosy were sent into exile between 1865 and 1969. In Brennert’s novel a little girl named Rachel is sent to Molakai, separated from her family and parents when she is just seven years old. Thankfully by the time she gets there in the 1890’s some order and decency has come to the place, due at least in part to the efforts of a Catholic priest Father Damien from Belgium. He lived on Molokai for sixteen years bringing many reforms until he eventually died of leprosy himself. In James Michener’s book Hawaii which I wrote about yesterday, a Chinese couple is exiled to the island before Father Damien has arrived and the conditions are inhumane. There is no law, no medical help, no government and terror reigns. Father Damien has died by the time little Rachel arrives on the island, but plenty of residents remember him and author Brennert does not describe him as a saint. 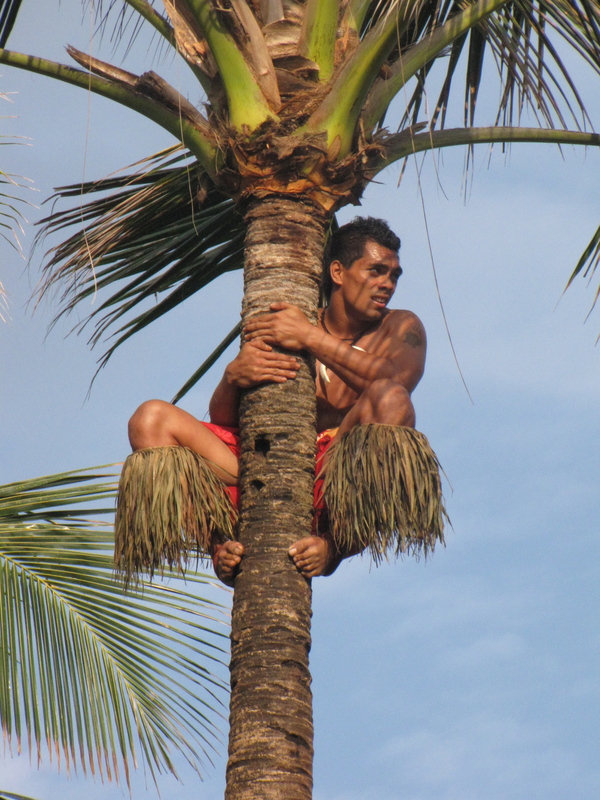 He got very angry when the Hawaiian people did the hula and practiced other rituals of their traditional religion. At the bedsides of dying leprosy patients who weren’t Christians, Father Damien did his best to convince them to convert in their last minutes on earth by describing in graphic detail the horrors of hell. Rachel grows up on Molokai in a girls’ home run by Catholic sisters. Eventually she marries a Japanese young man and they have a little girl, who they are forced to give up for adoption since babies who are leprosy free cannot stay on the island. Rachel is finally cured and allowed to leave the island and begins the search to find her daughter who by now has married and has children of her own. Rachel is not sure her daughter will even want anything to do with her. 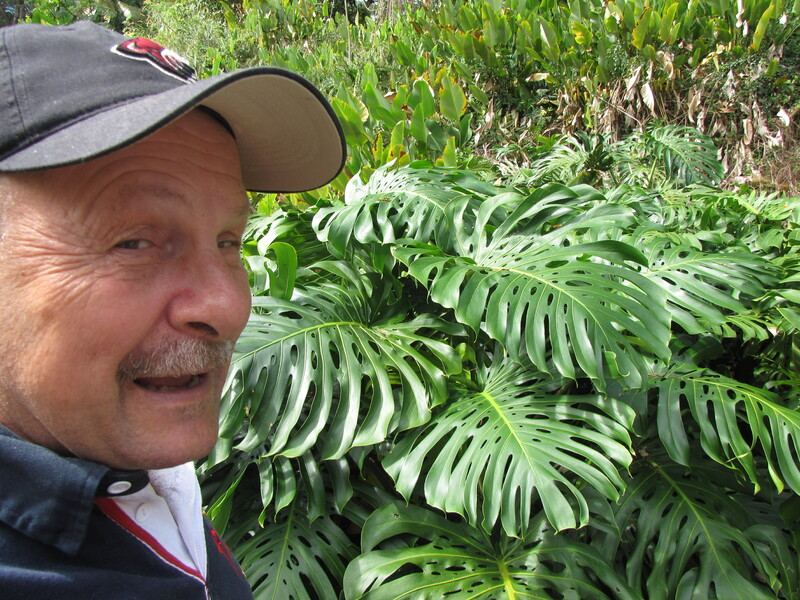 Brennert did meticulous research for his book and although some of his characters are fictional, many real people who lived on Molokai as well as those who visited it appear in the book, like authors Robert Louis Stevenson and Jack London. The book was very emotional to read and I highly recommend it. What next? I’d like to watch the movie about Father Damien, read the magazine articles Stevenson and London wrote about Molokai and visit the island myself perhaps on our next trip to Hawaii. 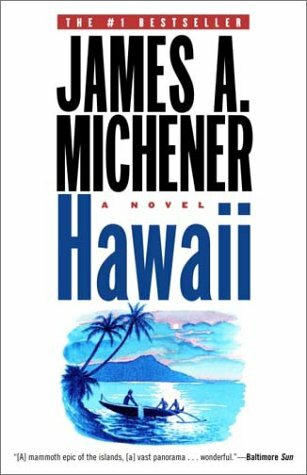 I read James Michener’s Hawaii before and during our visit to Hawaii. It was fiction but a great introduction to the history of the state. Michener looks at four groups of people who helped to shape the history of Hawaii, the first settlers from the island of Bora, Bora, the New England missionaries who arrived in the 1800’s, the Chinese immigrants and the Japanese workers. 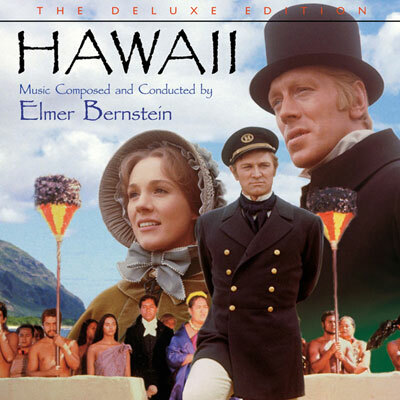 Religion plays an important role in Michener’s Hawaii. The Bora, Bora group are looking for a new place to live because the priests on their island have introduced a god who demands human sacrifice on a large-scale. The king and his brother can’t stand to see their most able warriors and family members dying in droves and they decide to leave and migrate to Hawaii where they can return to worshipping their old god who is not as bloodthirsty. Michener’s section about the missionaries from New England has been made into a movie with Julie Andrews and Max von Sydow. 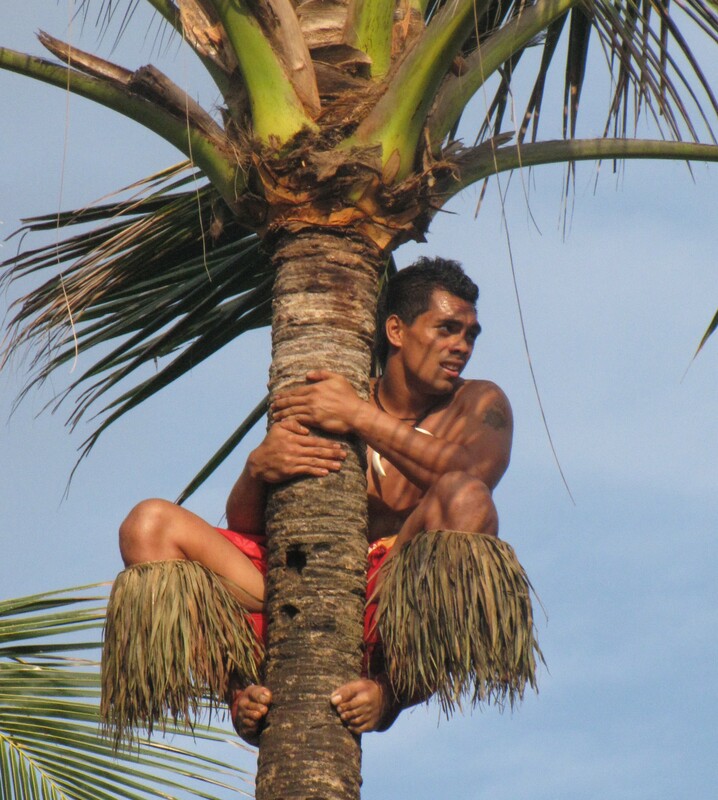 The missionaries view the Hawaiians as ‘heathens’ and fail to see anything good in their culture or religion. When one of the missionary woman is dying in childbirth they refuse to let the heathen Hawaiian midwives help her and she dies. It turns out the missionary families become the political and economic leaders of Hawaii and eventually get rid of the Hawaiian monarchy and become very rich and powerful running the island. They use their belief in their religious superiority to take over the nation. One of the ways they do this is by making it very difficult for Hawaiians to earn membership in the Christian church. Michener’s Christian missionaries are portrayed much the same way as Barbara Kingsolver describes the African missionaries in her book The Poisonwood Bible. The Chinese in Hawaii were treated as slaves and the Japanese who were imported to work on the sugar plantations are marginalized by the people of Hawaii until a contingent of Japanese Hawaiian soldiers fight heroically for the Americans during World War II. One thing I really liked about the book were the strong female characters. While her husband is preaching hell fire and brimstone to the Hawaiians, Jerusha Hale, the woman missionary, teaches the Hawaiian women to read and write and tries to warn them about the dangers of venereal disease if they keep sleeping indiscriminately with the sailors coming into Hawaii’s ports. The Hawaiians put up with Jerusha’s husband because of their warm feelings for her. Nyuk Tsin is a ‘second wife’ from China who ends up living in Hawaii till she is 104 and despite seeming insurmountable odds founds a huge land owning empire run by her descendants. She is one smart woman and her family loves and respects her. She arrives in Hawaii in the slave hold of a ship and dies the head of a wealthy corporation. I wish I could have read Michener’s Hawaii with a book club since it raises so many issues it would be great to discuss with others. Dave is reading the book now so maybe he and I can have our own little ‘book club’ discussion about it. 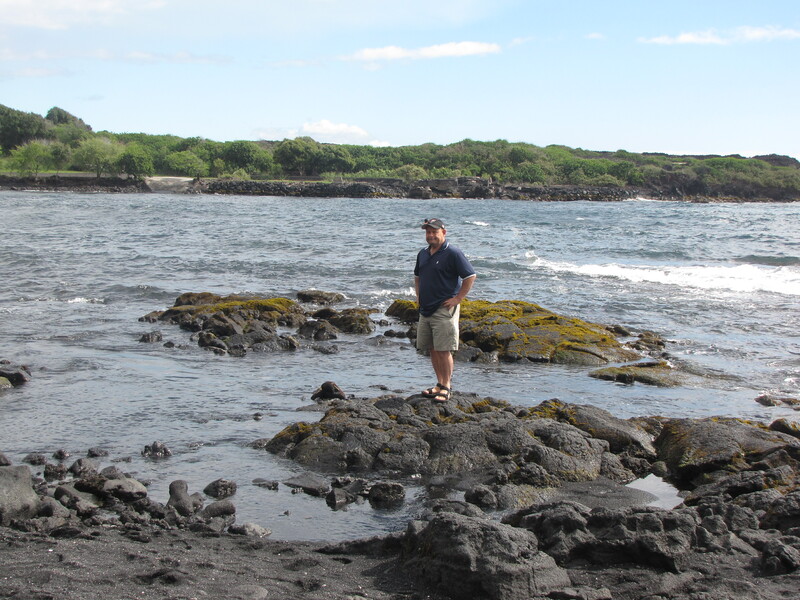 On our drive from Hilo to Kona we stopped at Punalu Black Sand Beach. 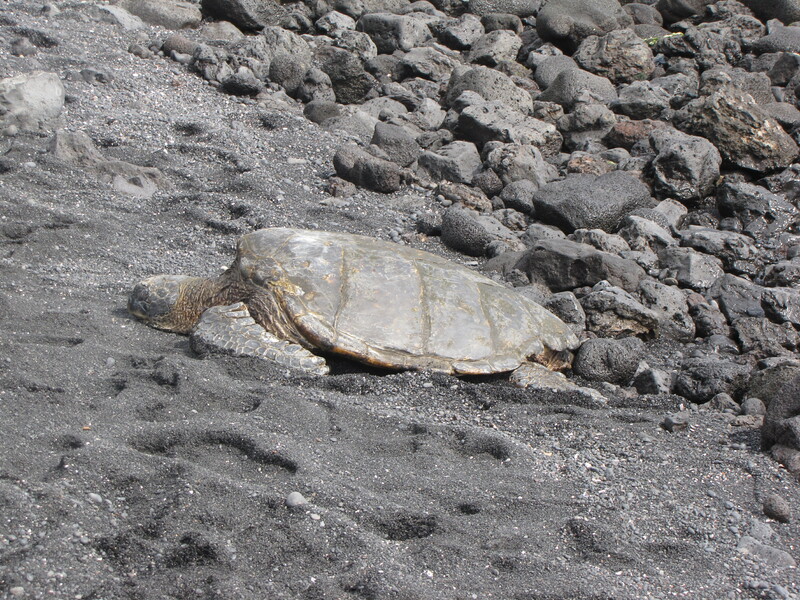 We had heard that it is a favorite haunt for Hawaii’s green sea turtles and sure enough we saw turtles resting in the sand and eating along the shoreline. These turtles used to be a severely endangered species but strict protection laws have allowed them to increase their numbers by 600% for a number of years now and they may soon be removed from the endangered species list. 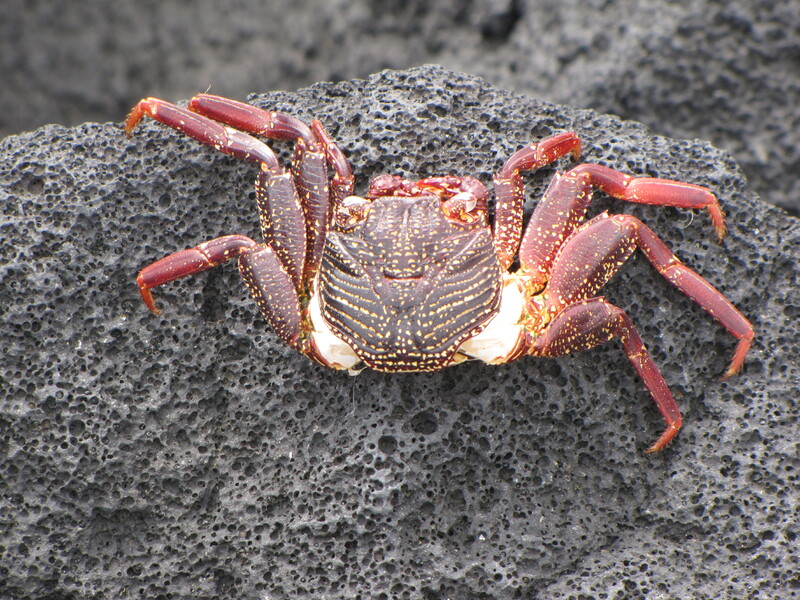 We saw lots of these crabs on the rocks at Punalu and……. 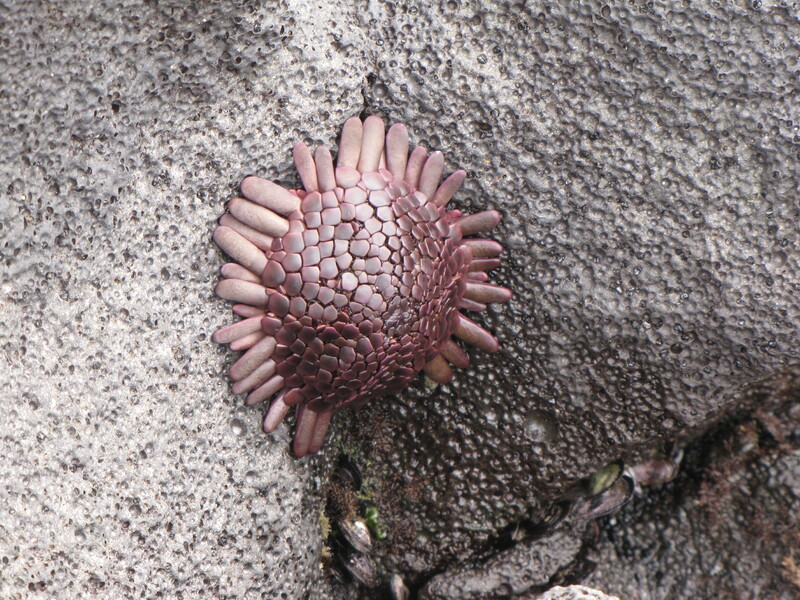 I also saw a bunch of these little creatures but I have no idea what they are. Can anyone identify them? They look like little wine-colored armadillos. 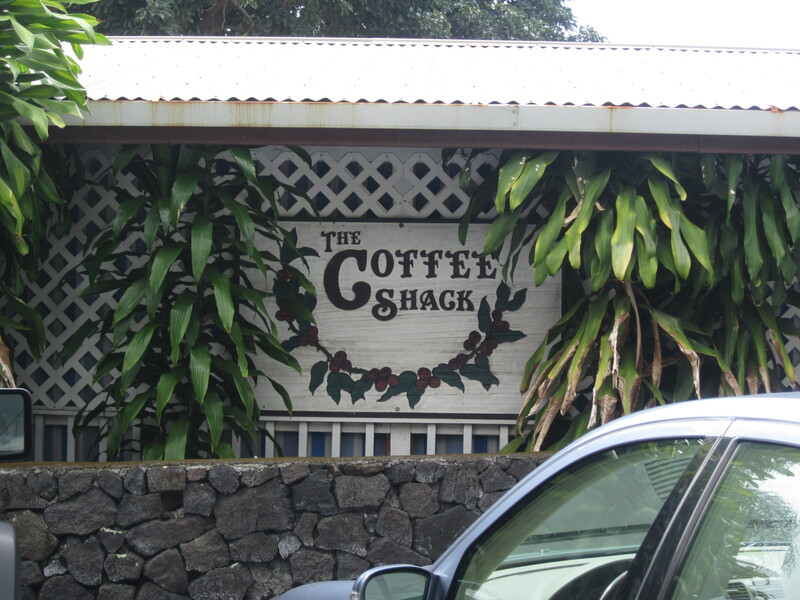 Further down the highway on the way to Kona we stopped for lunch at The Coffee Shack, which had received rave reviews in all the guidebooks. The sandwiches were great and the view from the porch spectacular. 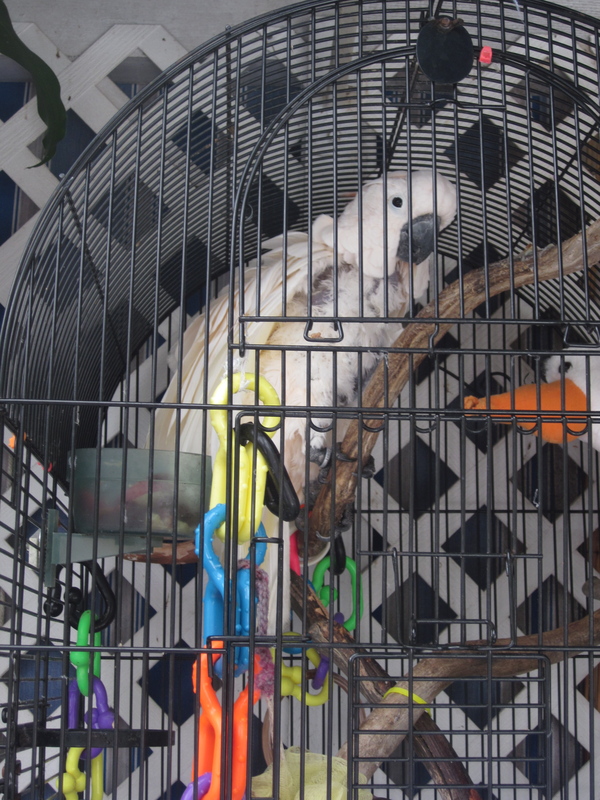 The Coffee Shack’s mascot is this cockatoo named Chopper. He doesn’t exactly qualify as a sea creature as the title of this blog post suggests but if you imagine him on the shoulder of some pirate on the high seas he might. 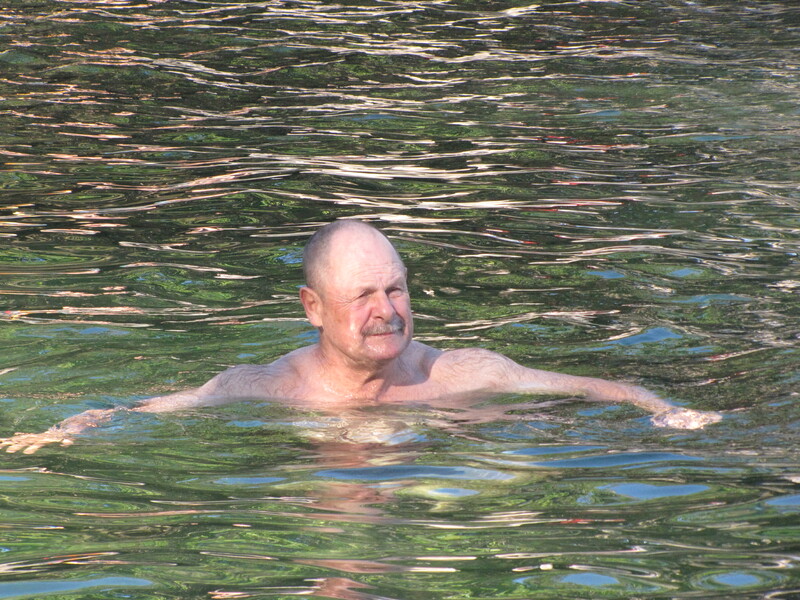 No this is not a sea creature but Dave on our snorkeling trip in Kona. We went out on the Fair Winds catamaran to Kealakekau Bay, the place where Captain Cook was killed by Hawaiians and is buried. It is an underwater marine park with absolutely pristine waters. The coral was diverse and huge,and we saw tons of fish of every kind of hue and shape. The snorkeling was so good we didn’t want to get out of the water. After about an hour though Dave decided to use the inner tube. He wanted to see more but was tired of swimming. 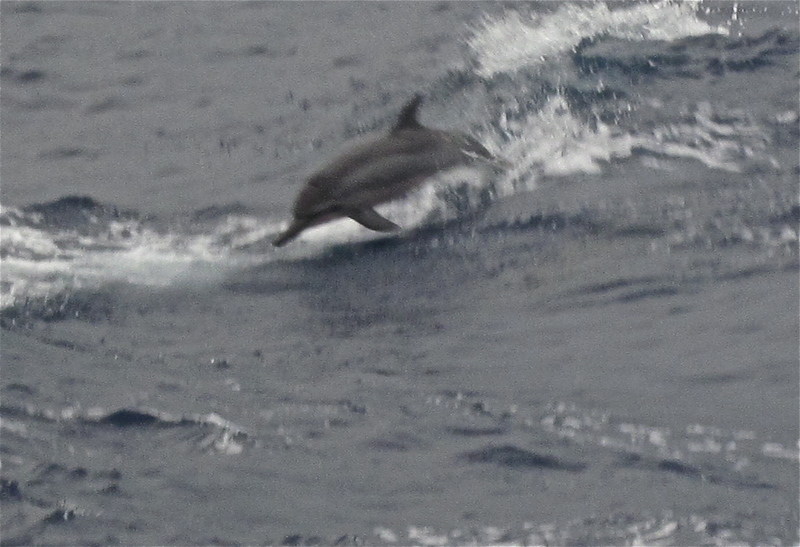 A large pod of spinner dolphins (our boat crew said more than a hundred) were in the bay with us while we snorkeled. They kept jumping out of the water doing fantastic dives and twirls. I was so sorry I didn’t have my big camera, just my little one but I did manage to get this blurry shot. The dolphins added lots of fun to our snorkeling trip. I have more photos but I need to end this blog post. We don’t have internet access at our hotel so I go early in the morning to a nearby beach side outdoor coffee shop to write these. The internet service here is very slow and it takes almost five minutes to upload each photo but the up side is I’m right on the ocean and in the early morning it is dark and I see the twinkling lights of cruise ships and the beacon of a lighthouse and hear the pounding surf. The sunrise is beautiful and once the sun is up I can see surfers, dolphins and sail boats. We spent four days in and around the Hilo area of Hawaii’s Big Island and it has definitely been the highlight of our trip so far. One of the reasons was our great accommodations. Friends recommended Ray and Lani Goodness Glory’s bed and breakfast called At the End of the Road. We are so glad we stayed there. 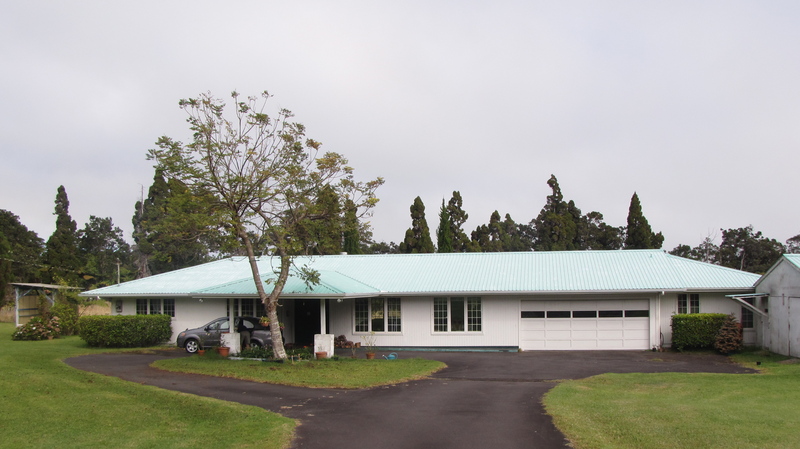 Our bed and breakfast experience on Oahu had been disconcerting, the worst we’d ever had on all our travels, so it was reassuring to come to this lovely home about a forty minute drive from Hilo where all our faith in the charm, warmth and beauty of the bed and breakfast experience was restored. 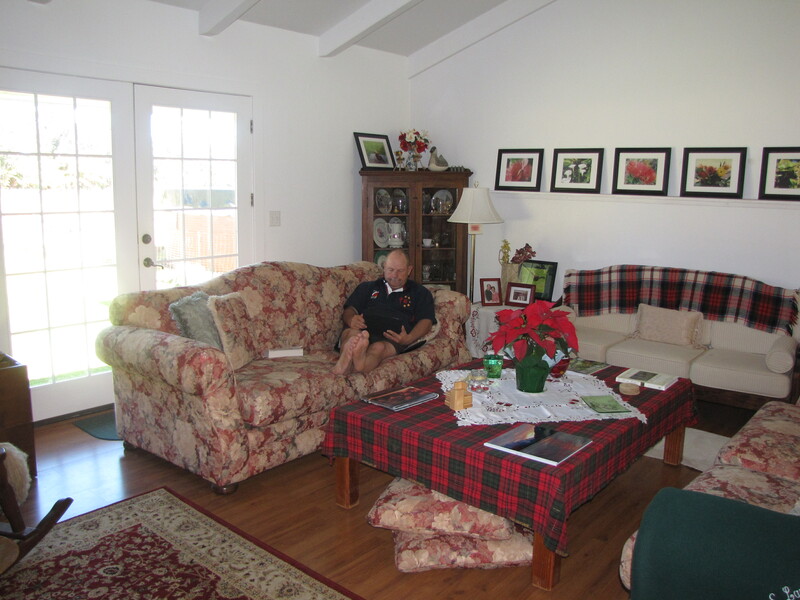 Dave is checking out the latest sports news on his I-pad in the cozy and spacious livingroom at the End of the Road which was decorated with gorgeous photos of Hawaiian flowers taken by Lani. We had a couple of relaxing mornings here reading and catching up with e-mail. Breakfast menus were printed out the night before and we chose what we wanted. Ray and Lani served us in the sunny diningroom. Another couple Ron and Suzanne, fellow Canadians from Kingston, Ontario were also staying there and we had interesting breakfast conversations, sharing sightseeing in Hawaii tips and stories. Ron and Suzanne had just traveled across Canada during Ron’s campaign for the presidency of Canada’s Liberal Party and although his campaign had not been successful their Hawaii trip was a reward for all the hard work they invested in the race. Ron had been part of Canada’s diplomatic corps in several places we had visited, so we compared experiences. One night we drove into Hilo for dinner and a basketball game at the University of Hawaii campus. 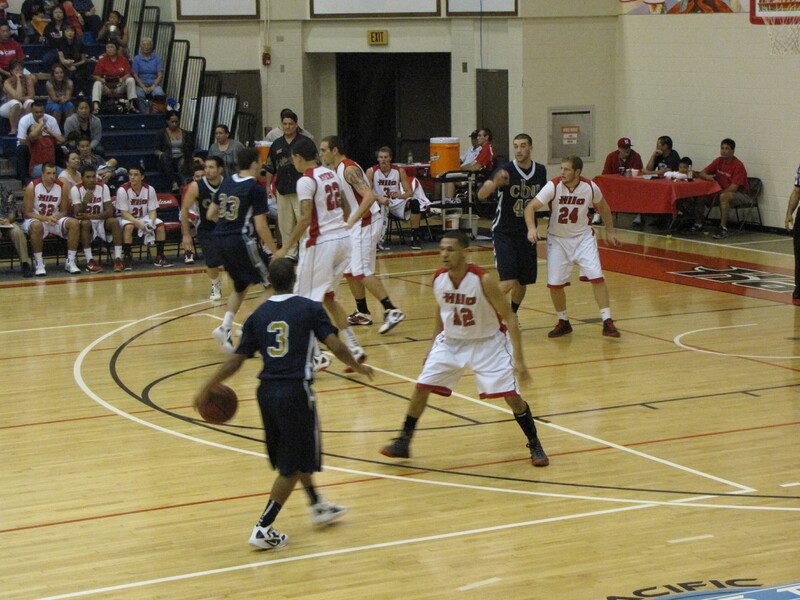 Hawaii at Hilo was playing a Baptist university from California in a league game. It was a tightly fought battle with California winning by only one basket. On the east side of the Big Island it seems everything is somehow connected to volcanoes. Yesterday I wrote about our hike in Volcanoes National Park. We also went swimming for several hours in Ahalanui Park in a volcanically heated thermal natural pool fed by a channel from the Pacific Ocean. Outside the pool’s stone enclosure huge waves were crashing into the rocky shore, but we could float idyllically in the warm soothing pool water which they say is a balmy 90 degrees. 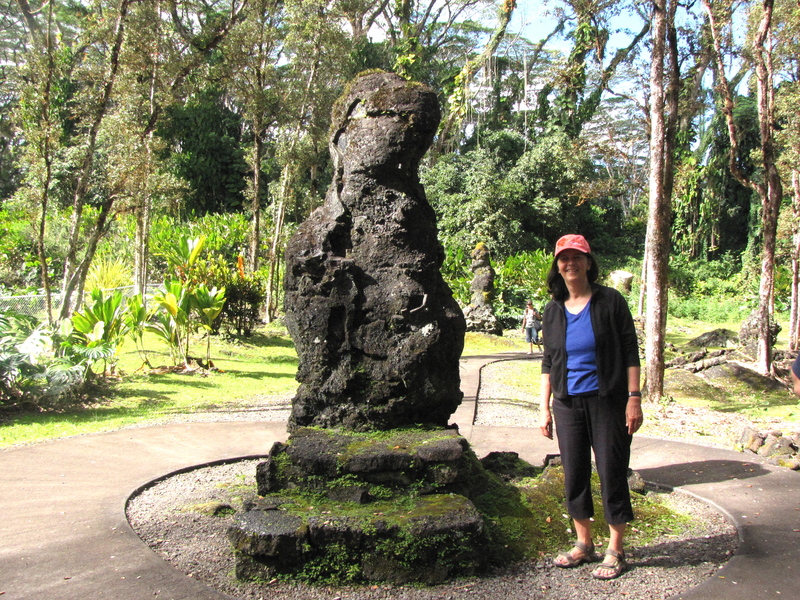 Another volcano related experience was visiting the Lava Tree Park. In the 1700’s, lava flow swept through the site, coating the trunks of the trees, leaving lava molds of the tree trunks in its wake, frozen in time. Can you see Dave hiding behind this piece of nature’s artwork? 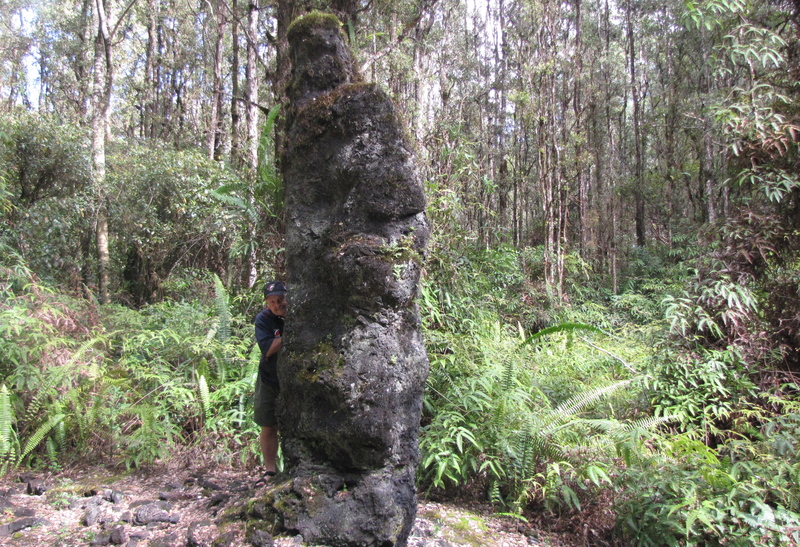 The lush green growing vegetation of the park provided a striking contrast to the dead black lava tube tree trunks. After our four days in the Hilo area we are headed for Kona and a few days there before flying back to Honolulu. Aloha till tomorrow!